It's been a little more than six weeks since I've saddled up and hopped on the blog. The #Tableau30for30 took a lot out of me and I've needed some time to recover :). So dynamic parameters. It's the number one most requested feature idea in the Tableau Community. Everyone seems to have come across a time where this would come in handy. It's a great idea and given the demand it should be implemented sooner rather than later. Unfortunately, it's not coming in the very soon to be released v8.2. You'll hear a lot about some very slick new features - Story Points and the Visual Data Window to name a few. But dynamic parameters ain't on the docket. So it's time we take matters in to our own hands. Parameters are really useful when you need to do something too complex to be handled by quick filters or action filters. However parameters are currently hobbled by the fact they have to be static lists. It would be really, really useful and solve a lot of Tableau gotchas, if you could define the options available for a parameter dynamically, from the result of a datasource, and preferably with the option to apply filters also. This will create a list of values based on the dimension selected. This static list now lives apart from your data set. If the data set changes (the company adds more product categories) this list will NOT update. This is the gripe. The thinking is that if the data changes, so should the parameter. So here we go. I'm going to propose an idea. Follow me for a minute. When we create a list of values in a parameter, it's as if we're informally creating a new table of values, based on a snapshot of the data, that now lives outside the the data. What if we just more formally create a table of values that remains based on the underlying data, yet lives outside of the full datasource (as a parameter would). What if, instead of calling this new table of a single dimension of data a "parameter", we called it what it really is - a small data source. And using the SQL from above, what do we get? A single value list with all of the Product Categories - this looks strikingly similar to the parameter we created, except for one thing. This is dynamic. This list will change if the underlying data would change. Notice the two data sources. Superstore is our primary data source and the single value list dynamic table based on Categories is the secondary source. Creating a multi-select quick filter works like a champ (make sure the two data sources have the correct links and relationships - which Tableau will make sure of if the headers have the same names). Is it a perfect solution. Nope - it's a hack. Are there a dozen reasons why it's not a best practice? I'm sure there are, and I'm sure the comments section below will let that play out. But with all that said - could it help solve a problem you're having? It just might. It's a crazy simple solution and my hope is that it sparks a conversation. I by no means think this is anywhere near the last word on this topic, but with v8.2 walking out the door, it's time we begin to amass ideas for v9.0. This is a great hack - I've been using a combination of sets and filters to get what I need, but this may be easier - I could set up different views in SQL depending on the "filter" I want and link them as a "data sources" listing my dimensions I need. Thanks Stacey - I do hope it's helpful. I know there are some weak points in the solution, but I also think there may be some cases where this could really help. Keep me posted on how it goes when you implement this! Thanks! Thanks Nelson! This looks promising. Hi Stacey any chance you can share your version of usage by combining sets and filters? Hey Nelson, some great thinking here around the problem, nice to get the ball rolling on how to solve for dynamic parameters. There are some use cases where the above does not currently work, for example if I want to use a calculated field like IF [Category]=[source2.product category] THEN [Category] ELSE 'Other' END and place that on the rows shelf or the color shelf it does not work. This is because a blend is required to get the viz, but that blend also means that any filters on the secondary source will also apply to the primary. So in a sense it becomes a quick filter rather than a parameter. Thanks for the feedback and you're right - because we end up using this as a quick filter you lose the ability to show an "Other". I've tried about 7 ways to Sunday using sets and combined sets to get around it, but to no avail at the moment. It's close, and I think it's fun to have ideas to talk about to kick the can down the road. Keep me posted if you come up with anything fun on this. Many thanks for checking it out. PeterG - See http://drawingwithnumbers.artisart.org/creating-a-dynamic-parameter-with-a-tableau-data-blend/ for how to get something like what you want. You can turn off the Category as a linking dimension in the secondary source, in which case a filter on the Category in the secondary only filters the secondary and not the primary (and vice versa). However, to have the match work right for a [Category] vs. Other then the Category (or a field with finer granularity than Category) has to be in the view as a dimension (since all calculated fields using dimensions or measures from the secondary have to be aggregated, the view has to have fine enough granularity so the comparison will work), in which case to make an Selected vs. Other value you'd need a table calculation to aggregate over all the Categories. You can see an example of that in http://drawingwithnumbers.artisart.org/selecting-one-to-see-one-vs-all-other/. There are also ways to use Sets from secondary sources, see http://drawingwithnumbers.artisart.org/how-to-have-sets-with-your-secondary-data-sources/ for details. However, selecting the particular value of a dimension to use for the IN/OUT of a set from the secondary is just like for the primary, there's no real dynamic way to do that outside of Tableau desktop, unfortunately. Nelson: I'm glad to see someone else posting this idea, I've been exploring various funky use cases for data blending for awhile now and there are some very cool things we can do with it! I also tried the technique in your second blog post but it seems to be dependent on having another blend (i.e. on date), is that correct? This is certainly a brain tax! Is it possible to insert these "parameters" into text? I am able achieve the above mentioned trick to filter different (Data Source) worksheets on a single dashboard, but when I follow the same for multiple Dashboards is it possible to achieve parameter action with the quick filter when all my data sources for each dashboard are blended together by a common field ? Get SAP Successfactors Online Training by Certified consultant from India. Enroll for Expert level Instructor Led Online SAP SuccessFactors Training. Apply today! Nice Blog, thanks for the article. For tutorials, interview questions and online training on Dell Boomi Visit TekSlate. Hello everyone i am charlotte cora by name.I was diagnosed with HERPES for close to a year and 4 years my friend Cindy introduced me to Dr Abaka that i can be cured by him which I never believed because I have spend so much money on different doctors. She advised that i give it a try because he cured her of Cancer with natural herbs. So I mailed him and complain to him about my illness, he said to me I am in the right place. Today i am the most happy person on Earth all thanks to Dr Abaka, he cured me with his herbal medicine. All i did was to order for the herbs which he sent through courier delivery services and he instructed me on how to apply it for a period of 2 weeks, before the completion of the 2nd week i was totally cured .I'm so happy thank you Dr Abaka. I share this because of the pain i passed through when i had it and i care about those passing through the same pain. He also said he has herbs for all kind of illness including HIV/AIDS, ASTHMA, CANCER, DIABETIC 1&2, BARRENNESS, IMPOTENCE, WOMB DAMAGE, HIGH BLOOD PRESSURE and EPILEPSY, Email him now on drabakaspelltemple@gmail.com or call him on +2349063230051.Thank you doctor i will keep on telling the world about you because i am free of genital herpes forever. How do we do if we have to set the parameter dynamically in production for multiple data sources. does tableau support this. Thanks for sharing this solution. I had never thought of using SQL to create a single value data-source, and I can see a lot of possiblities for how this could help me with other situations. However, in this case I need to add the parameter to a stored SQL procedure. 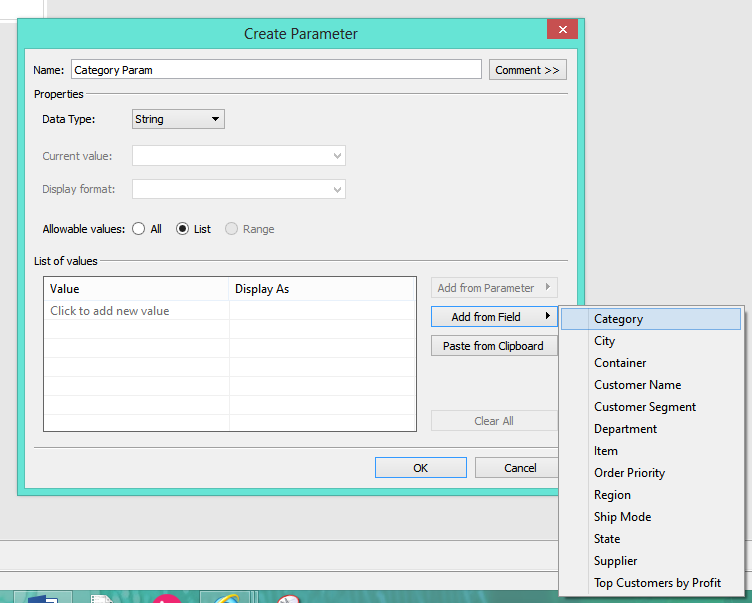 Your solution changes the data-type from a parameter to a filter. I need the data-type to remain 'parameter' so I can add it to a stored procedure, and it would be nice if I could make the parameter within the procedure dynamically update based on the data-source. 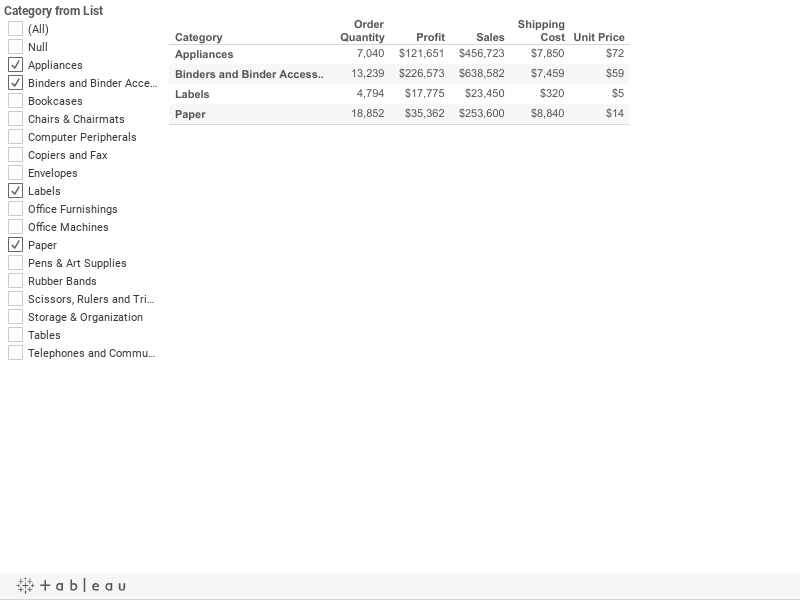 Great presentation of Tableau form of blog and Tableau tutorial. Very helpful for beginners like us to understand Tableau course. if you're interested to have an insight on Tableau training do watch this amazing tutorial. It's A Great Pleasure reading your Article, learned a lot of new things, we have to keep on updating it learn Mulesoft online Thanks for posting. Tableau and Google Maps - Finally friends again! InterWorks Blog | InterWorks, Inc.